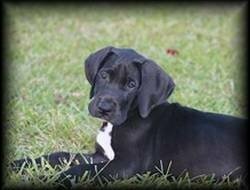 Your Great Dane is of German Ancestory so it is only fitting for them to have German Dog Names. Edda Female Pleasant. Strives. Variant of Hedda or Hedwig. Elfrida Female Peaceful ruler. Variant of Frieda. Elke Female Noble. Variant of Alice. Emery Male Brave: powerful. Variant of Amory. Emil Male Derived from Roman clan name which may mean industrious. Emmaline Female Hardworking. Variant of Emily. Emmalyn Female Hardworking. Variant of Emily. Emmeline Female Hardworking. Variant of Emily. Emmy Female Hardworking. Variant of Emily. Falk Male Surname relating to falconry. Fernanda Female Adventurous. Feminine of Fernando. Fredda Female Peaceful ruler. Feminine of Frederick. Freddie Male Variant of Frederick peaceful ruler. Freddy Male Variant of Frederick peaceful ruler. Frederica Female Peaceful ruler. Feminine of Frederick. Frederick MaleTable Cell Peaceful ruler. Frederika Female Peaceful ruler. Feminine of Frederick. Frederike Male Variant of Frederick. Peaceful ruler. Alternate Spelling: Fr�d�rique, Frederika and Frederica. Fredrika Female Peaceful ruler. Feminine of Frederick. Frieda Female Peaceful ruler. Feminine of Frederick. Friedrick Male Nickname variant of Frederick peaceful ruler.